Palau is a world unto itself. Although located just outside of the official “Coral Triangle” (an area of pristine marine habitat covering around 2.3 million square miles between the Philippines, Timor, and Papua New Guinea), it has four times the reef diversity of the Caribbean. While there are more than 1,500 species of fish and more than 600 species of coral, along with a plethora of colorful birds, shy mammals, and endangered turtles, we’d like to share with you some of our favorites. 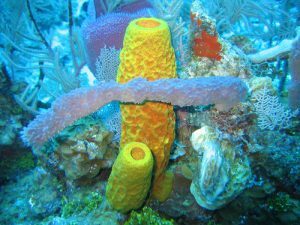 Sponge coral – We like sponge coral for its vibrant colors of purple, red, and yellow. It’s made from tiny organisms called polyps that attach themselves together. 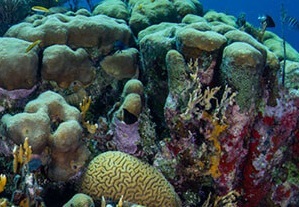 Their hard limestone skeleton is what forms the structure of the coral, which then acts as a single organism. But because the polyps don’t attach completely, there are small holes, thus creating a sponge like appearance. B rain coral – Brain coral is just plain cool for its brain-like appearance and fascinating behavior. They have tiny tentacles that reach out to catch food, can live for up to 900 years, and can grow as large as six feet in diameter! 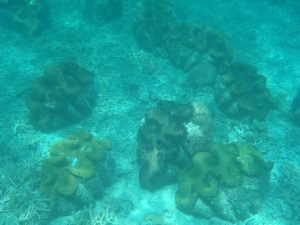 Unlike sponge coral, the polyps that build brain coral are more closely connected making it stronger but also more vulnerable to disease than some other corals. Giant clam – Giant clams are the largest mollusks on the planet and can weigh more than 500 pounds! Needless to say, once they attach themselves to a spot, they don’t ever move. Sadly, giant clams have been overharvested for food and their shells and are now listed as a vulnerable species. They remind us of the movie Cocoon from the 80s! D ugong – If you spot a dugong on your trip, count yourself extremely lucky. These peaceful, quiet mammals are shy “sea cows” and can weigh upwards of 800 pounds. While related to manatees, their tail resembles that of a dolphin’s. 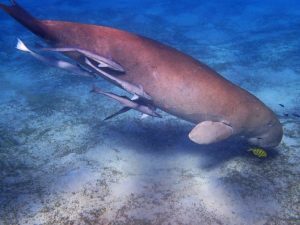 Did you know that dugongs are genetically related to elephants!? 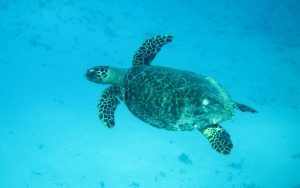 Hawksbill turtle – Named for their pointed beak resembling that of a hawk, these turtles are critically endangered, as they are hunted for their highly-prized shells. The chance to spot one in the wild is a once-in-a-lifetime opportunity that may not even be possible in the near future. 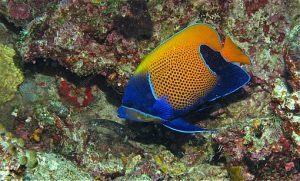 B lue-girdled angelfish – One of the most striking fish in the Pacific Ocean, adults have bright yellow to orange faces, dorsal fins, and tails that contrast with a deep blue underbelly. Electric blue markings add to it stunning appearance. They can live up to 21 years and reach about 10 inches in length. This is a shy fish that likes to dart in and out of coral, so sudden movements may frighten them away, but stay still for a bit and it should re-emerge.